Want to experience music in VR? You won’t only feel the music, but become part of it. Whether it’s movies, video games, or a live event, music can make or break an experience. This is especially true you when you pair it with something as immersive as virtual reality. That said, these are some of the best music apps for the HTC Vive. Download and enjoy! When I feel tense from a long day, music is the best way for me to relieve stress. I turn it up loud, and with no-one but my pet bunny around to watch, I sing and dance to my favorite songs. Music lovers – if this sounds like you, download Soundboxing without hesitation. Soundboxing is a VR rhythm melee game that challenges you to box to the beat of the music. Unlike other VR music games such as Audioshield and Thumper, Soundboxing separates itself with its creative approach. You’ll immerse yourself into a musical matrix where you can choose any of your favorite songs on YouTube. If you’re lucky, someone may have added a beat challenge to the song you selected, so you can start punching immediately. If the song hasn’t been played by someone before, well, now you’re the punching maestro! You can create a challenge for others to experience. Soundboxing has gained quite the reputation for being a great workout, and I can confirm that’s the case! You’ll have fun trying to beat the high scores on your favorite songs while working up a sweat. I know what you’re thinking. “Please don’t make this an article all about rhythm games.” No worries – I completely understand that desire and want to show fellow music aficionados that there’s more to music-fueled VR than rhythm games. SoundStage not only lets you experience music, but also allows you to create! Utilizing room-scale virtual reality, SoundStage is a sandbox app that you can turn into a complete music studio. Whether you’re someone who enjoys a bit of experimentation, or a musician looking to immerse yourself in the magic of the 80s, there’s no shortage of synthesizers, drums, sequencers, and so much more to choose from. The best part? SoundStage has an easy to use interface that ensures anyone from any skill level will have a great time. My favorite past time involves recreating themes to popular television shows and movies. With SoundStage I can spend hours jamming out in VR, and it doesn’t require me to spend a ton of money on equipment, or annoy people with my terrible drumming skills. It’s a win/win for everyone! Festivals bring people from all over the world together. They make for some incredibly memorable days and nights filled with music, dancing, and friends. 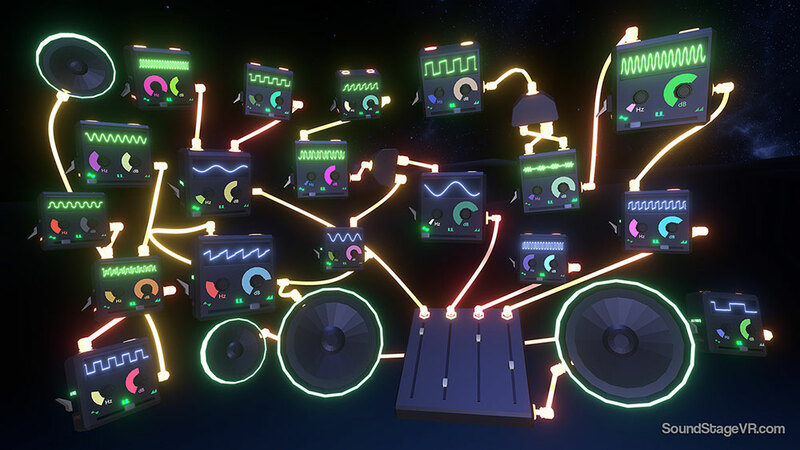 TheWaveVR is a Vive app that replicates this experience by whisking you away and letting you jump into a pulsing neon music show that you can enjoy with fellow music lovers whenever you want. Although it’s in Early Access, TheWaveVR capitalizes on a concept that anyone with a love for music and entertainment will find fascinating. It’s as simple as putting on your Vive headset and jumping into a new world where you can find good music and camaraderie among other festival goers. Check the billboard to find out when the next show takes place, or grab a few friends and host your own party where you’re in control of the music. As the DJ, you’ll choose the music and control the visuals, putting on a spectacular show for your friends to enjoy. Conversely as the showgoer, you can dance and embark on a virtual psychedelic journey. So far, all of the music apps I covered require a good amount of mental and physical energy, so this one is for the people who want to sit back and enjoy the experience. PolyDome immerses you into an environment that changes every time you interact with it. The app does this through different modules that you choose, and the more that you add, the more intricate the sounds become. PolyDome is still in Early Access, which means you can expect more content as the developers make some progress. There are talks of including more ways in which players can interact with the environment. Recently, a module called Wavecraft was added, which lets you use your voice to build structures that you can then loop to add more dimension to the virtual world. I stumbled across PolyDome while looking through the free VR experiences on Steam. I immediately fell in love with the gems, which are little nodes that come in different shapes that produce unique sounds. You then insert as many gems as you’d like and connect them to create beautiful music sequences that you can navigate in VR. The amazing part is that each time you play, you’ll receive a different musical experience. Finally, there’s the ultimate Vive app for music lovers. Similar to SoundStage in its studio-like approach, The Music Room is a VR application that’s more of a realistic simulation. Featuring a variety of instruments that include drum kits from Pearl, Zildjian, Sabian, and Ludwig, The Music Room allows you to play an instrument similar to the real thing. It’s an app that’s directed at professional musicians, allowing you to practice in famous locations like the Cherry Bar and Bakehouse Studio. You can practice performing live or record your own elaborate song! There’s no holding you back from expressing yourself and getting a taste of what it feels like to be a professional in complete control of the music. I know the first point of contention with many people on The Music Room is the price, and while it’s definitely not pocket change, it is a worthwhile investment for those who are serious about making and playing music. You’ll not only save on equipment but also gain valuable performance and recording experience through a virtual world where mistakes are much more forgiving. Soundboxing, TheWaveVR and PolyDome are available on Steam. Soundstage and The Music Room are available on Viveport.